Solicit: SERIES FINALE. “THE END OF ALL THINGS,” Conclusion. Final issue. Everything since issue one has been building to this. Nothing can prepare you. I forgot that I made this issue my pick of the week on our last episode, so I didn’t start playing catch up on my reading until Tuesday night. 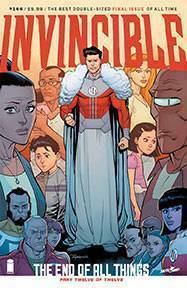 16 issues in 16 hours later and I was ready for the Invincible finale. Well, I wouldn’t say I was ready for it, because I didn’t want this book to end. This is going to be a pretty short review because it will be impossible to discuss this issue in depth without spoiling so many shocking, touching, amazing things that happened to Invincible and his supporting cast over the course of the epic, 12-issue The End of All Things storyarc. Suffice it to say that Robert Kirkman and his longtime collaborators bring closure to nearly every aspect of this book’s 15-year run, while planting fun seeds for the future. Kirkman wraps up the story of Mark Grayson and his family in a way that leaves the door open to grow those seeds into new stories. He may never intend to go back, but having the potential there feels right. 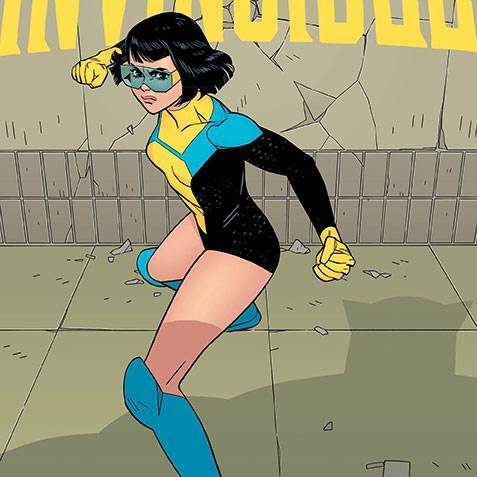 The issue’s final moment calls back to the scene where Invincible revealed itself to be more than just a generic teen superhero title, and it’s an absolutely perfect send off. Invincible has never just been about Mark and his friends fighting super-villains and aliens. It’s been about Mark learning how to become a better hero, making lots of mistakes along the way, and the impact he had on those around him. The second half of this issue is the culmination of that journey. Longtime Invincible artist Ryan Ottley illustrates the first half of the issue, dealing with the aftermath of The End of All Things on Earth. Ottley is probably one of the best superhero artists on the planet and he wraps up his legendary run with a bang, bringing the book full circle. I used to think that Ottley was the superior artist for this book, but I’ve come to appreciate series co-creator Cory Walker more and more every time he comes back for a return visit. Ottley may edge Walker out when it comes to brutal action scenes, but Cory Walker injects his characters with such expressiveness. The knowing chuckle in the final panel took me tight back to Superman’s final wink on the last page of Whatever Happened to the Man of Tomorrow. This book has also been blessed with wonderful colorists and letterers like FCO Plasencia and Rus Wooten. Nathan Fairbairn does tremendous color work on this final issue. Robert Kirkman told the story he wanted to tell, one that had lasting consequences for the characters, and that had a natural progression that allowed the characters to change and grow over time. I didn’t want Invincible to end, but I couldn’t have asked for a better send off than this.